The workup on workout injuries is easy in a primary care setting, according to one orthopedist. At an Internal Medicine 2011 session on “Evaluation of the Weekend Warrior,” C. David Geier Jr., MD, assistant professor of orthopedic surgery and director of sports medicine at the Medical University of South Carolina in Charleston, had a message for his audience of internists. “What I do isn't rocket science,” he said. “The surgeries are very technical, but as far as workup, it's not that hard.” It's also quick; many tests can be done in less than a minute. Dr. Geier offered advice on evaluating knee injuries, the most common type of sports-related injury. First and foremost, a careful history can help narrow down potential causes of the patient's problem. Age, for example, is one indicator: In young adults, knee injuries are typically ligament tears and patellofemoral pain syndrome, while older adults more often have degenerative meniscal tears and osteoarthritis. The way an injury occurred can also give physicians a clue to its type. Knowing what sport the patient plays is key, Dr. Geier said. Patients with a knee injury due to collision or contact sports generally have fractures or ligament injuries. Jumping sports, like basketball and volleyball, most often lead to tendinitis, while repetitive sports, like running, cause overuse syndromes. “Runners, unless they fall or something like that, almost never have meniscal tears, ligament tears, things like that. It's all overuse,” he said. It's also critical to determine where the pain is located and what activities or motions reproduce the symptoms, such as twisting, ascending or descending stairs, or sitting for a long time. “The vast majority of [these injuries] do not hurt with everything you do,” Dr. Geier pointed out. Internists should also find out what types of remedies patients have tried up to that point, such as rest, anti-inflammatories, physical therapy or cortisone injections. Dr. Geier recommended four questions for internists to ask a patient with a knee injury. “These are the ones that potentially tell you that something bad is going on,” he said. 1. Is the knee swollen? If swelling is visible, that's almost never normal and requires a thorough workup. 2. Does the knee buckle or give way? If so, that may indicate a torn anterior cruciate ligament (ACL) or quadriceps weakness. 3. Does the knee lock or catch? A knee that gets stuck in a certain position can indicate a meniscal tear. 4. Does it hurt to go up or down stairs? That indicates a patellofemoral source for the pain. ACL injuries might be commonly associated with pro football players, but Dr. Geier said they're actually two to eight times more common in female athletes than males. They generally result from a twisting injury when the foot is planted, and the injured person usually feels or hears a popping sound. The knee swells immediately, can't easily bear weight, and gives way with turning or cutting maneuvers. The treatment for ACL tears is almost always surgical, Dr. Geier said. But injuries to the medial collateral ligament, which often result from contact, almost always heal on their own with the use of a brace or immobilizer. Patellofemoral pain and iliotibial band syndrome, the latter of which is common in runners, also respond to nonsurgical treatment, such as physical therapy, home exercises and stretching. Acute meniscal tears, which are due to a twisting injury and present with localized pain and locking or catching, generally don't heal well without surgery. “Nonoperative treatment is unfortunately somewhat abysmal,” Dr. Geier said, because the injury doesn't heal and the symptoms don't improve. However, for a degenerative meniscal tear associated with arthritis, surgery isn't usually a viable option if the arthritis is the actual source of the pain. This is one reason why Dr. Geier cautions against proceeding directly to an MRI for knee injuries. MRIs can show the meniscal tear but not the associated arthritis, so patients who get just an MRI will expect surgery to cure them when it won't. X-rays should be done first in almost all knee injuries, especially in patients over 40, Dr. Geier stressed. However, “a non-weight-bearing AP [anterior-posterior] lateral X-ray—which, sorry, all of you guys do—is not terribly helpful either,” he said. It's important to get weight-bearing views that involve flexion to help show joint space narrowing, he noted, and to X-ray both knees so you can tell the difference side-to-side. Dr. Geier's routine X-ray sequence for a right knee includes a standing AP, a lateral right knee, a standing bilateral AP in 45-degree flexion on one cassette, and bilateral Merchant views on one cassette. Dr. Geier advised internists who aren't comfortable evaluating knee pain to refer directly to an orthopedic surgeon rather than immediately ordering an MRI. This could help prevent overuse and unnecessary testing, he noted. Dr. Geier also gave specific advice on performing a physical exam in a patient with a knee injury. “You've already got a mental differential based on your history,” he said. 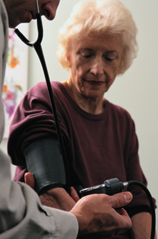 The physical exam can then be used to rule conditions in or out and to make sure nothing is missed. Most of the time, however, swelling is more subtle, and a physician can use a test called the milking maneuver to demonstrate it. “You take your hand and kind of milk fluid down from the suprapatellar pouch, and what you'll see is kind of a fluid wave on the medial side of the knee,” indicating a more subtle effusion, Dr. Geier explained. There's usually no effusion with arthritis, he noted. When assessing range of motion, there are two things to remember, Dr. Geier said. First, check the patient's extension. “You should not be able to slide your hand under the knee with their knees in full extension,” he noted, “and if you can, especially after an acute injury, if they lack full extension, that's a pretty good sign something bad is going on,” such as a torn ACL or a torn meniscus. Second, check to see whether the patient has pain with full flexion. That could indicate a meniscal tear, Dr. Geier said. Lachman's test is the classic test for a torn ACL. “It requires practice, but if you do it enough, especially on normal knees so that you know what to expect with abnormal, it becomes very easy,” Dr. Geier said. To perform Lachman's test, he said, use one hand to stabilize the femur, the other hand to stabilize the tibia, and pull straight forward on the tibia. “It's a rapid movement, it's not a gradual pull,” he said. If the ACL is intact, you will hit a firm end point with the tibia stopping suddenly, but if the ACL is torn, “It doesn't stop. It has kind of a mushy end point,” Dr. Geier said. The anterior drawer test involves bending the knee up to 90 degrees—”I usually sit on the foot to do this so I don't slide the patient down,” Dr. Geier said—and pulling the tibia anteriorly looking for the end point. It doesn't work as well as the Lachman's test for ACL in most patients but can be useful in larger patients, such as football players or those who are obese. Meanwhile, the posterior drawer test, pushing posteriorly to find an end point and the posterior translation, is the definitive test for injury to the posterior cruciate ligament. “You can do Lachman's, anterior drawer and posterior drawer test all in about 10 seconds,” Dr. Geier said. The varus/valgus stress tests are collateral ligament tests involving directional motions. In the valgus test, Dr. Geier explained, a physician moves the ankle laterally and opens up the medial side of the knee to test the MCL, while in the varus test, a physician moves the ankle medially to test the lateral-sided structures. “This is another diagnosis you can make by physical exam,” he noted. The McMurray test is the classic physical exam test for meniscal tears; studies have shown that it has a sensitivity of 97% when performed correctly. “I don't know if it's quite that good, but if this is positive, it's probably going to initiate you guys working this up,” Dr. Geier said.